Seeing turtles on Maui is such an amazing experience because they just give you that bubble of joy when you see them. They’re just so darn cute! Luckily, it’s easy to see these guys as long as you know where to look (or snorkel!). 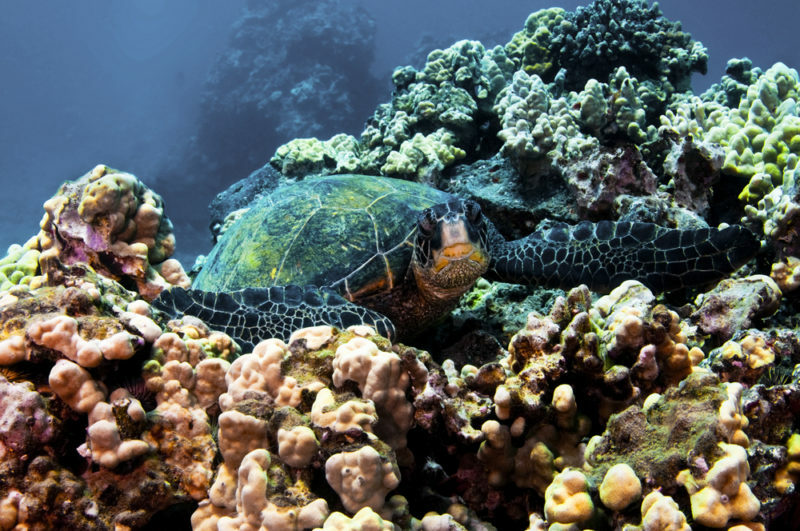 Maui has plenty of reef formations that have formed several caves – an oasis for the Hawaiian green sea turtle. Snorkeling is one of the best ways to see turtles on Maui, but you can also see them out of the water quite easily on certain beaches. In fact, many of these turtle hangouts have so many turtles that you’ll see them popping their head up and down as if they were taking turns. #1 Best Place For Turtles On Maui? Turtle Town! After years of lava flow into Maui’s south shore, there is now a large underwater lava formation dubbed “Turtle Town” that runs from Nahuna Point to Black Sand Beach. If you can find a nice viewpoint anywhere along this stretch of beaches, most likely you’ll spot a turtle or two bobbing in the surf. The natural caves, crevices and reef in this area are a haven for turtles on Maui, but the beach you really want to get to is Maluaka beach. This is THE place to see turtles on Maui enjoying life under the sea. Get your snorkels, mask and fins ready because there’s plenty to see here! Not only do turtles call Turtle Town home, but also a variety of reef fish and sea creatures that will enchant you for hours underwater. There are no signs or a big entrance for Maluaka beach – which is great news since this helps this beach and the real Turtle Town to stay secret-ish. Ask locals or follow your GPS to get onto the correct road. There’s parking, bathrooms and showers available, too. The water here can get choppy or shallow at times so pay attention to the weather and always snorkel with a buddy. Maluaka beach can get crowded (especially on weekends) so I recommend getting here early in the morning to avoid the crowd and enjoy calmer waters. Maluaka beach is not the only beach on Turtle Town that you can try. There are plenty of other snorkeling spots that will give you the chance to swim with turtles on Maui. Ask around and I’m sure Maluaka beach won’t be the only beach that’s mentioned to you! “Sidewalks” as it is fondly called, is a great beach for beginner snorkelers. The waves don’t get too wild here and there’s still plenty of corals, fish and turtles to see. The water is consistently clear here so you won’t have to strain your eyes either on a murky day. It’s also a great beach to just laze about and there’s even a rental area for those interested in kayaking or other beach activities. 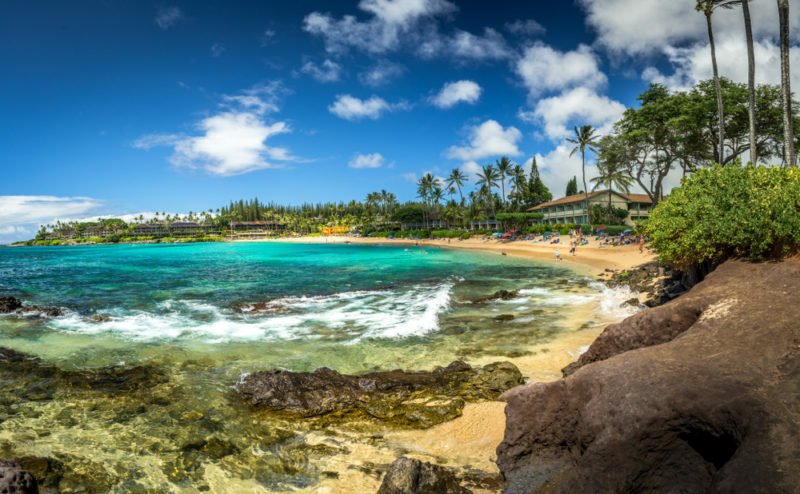 One of the great things about Keawakapu beach is that it usually doesn’t get as crowded as other more popular beaches. There is free parking, portable toilets and showers for you to use. Plus, with 2 restaurants close by, you won’t have to worry about where lunch or dinner will be. Young kids can enjoy this beach too since the smaller waves create some nice boogie boarding and wave jumping opportunities. You’ll also enjoy the scenery here since you’ll be able to see other islands in the distance. 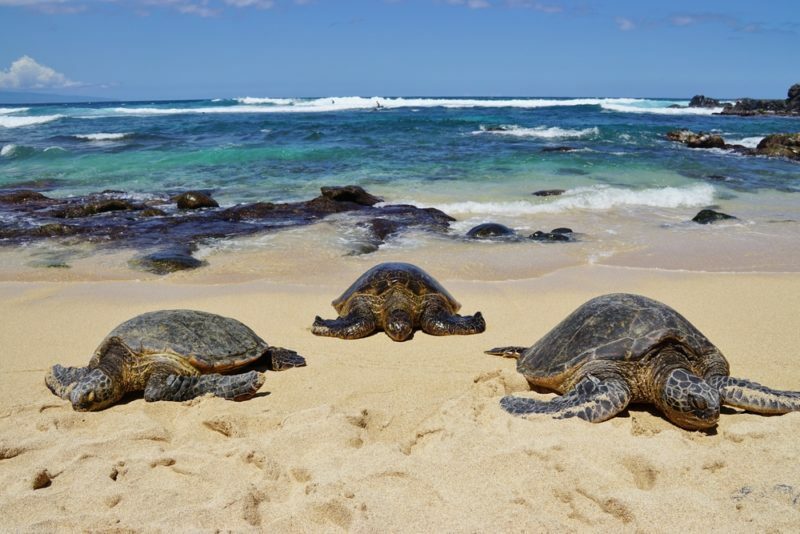 Now if you want to see turtles on Maui without getting into the water, then Hookipa beach is perfect for you. 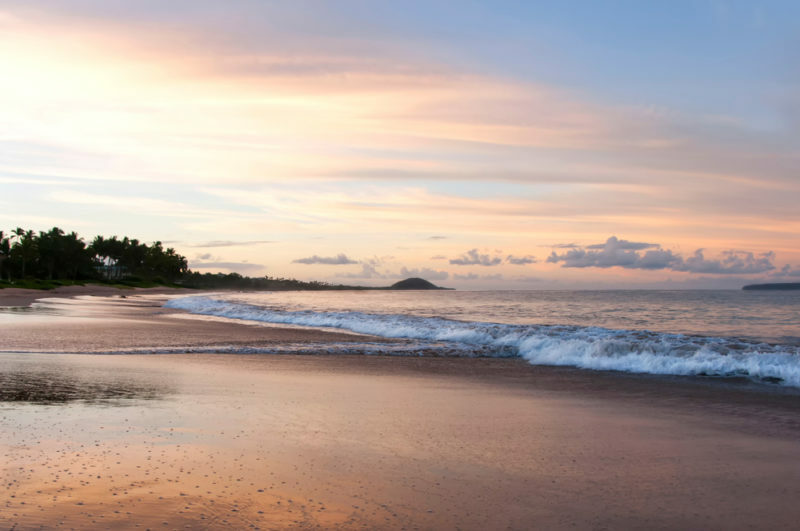 Coming here before sunset will pretty much guarantee that you’ll see turtles pulling themselves up onto shore to sleep, but you’ll probably see them throughout the day warming themselves up under the sun’s rays. The turtles here are used to us humans making a spectacle of ourselves so they generally just ignore you as you snap your selfies. The beach itself is a pretty one, but the waves are strong here. In fact, Hookipa beach is known for windsurfing and kitesurfing. But don’t expect to be the only one there. People are constantly coming and going to see the turtles here and luckily the crowd moves fast since parking is very limited. Hookipa beach is on the road to Hana so definitely make this a stop! If you’re in Wailea and want to see turtles, check out Ulua beach instead of the very popular Wailea beach. The parking lot fills up quickly in comparison to other beach parking lots so get here early for a morning snorkel. Otherwise you’ll be forced to park farther away and will have to walk at least 10 – 15 minutes. Ulua beach is also right next to Keawakapu beach and has the added bonus of bathrooms. Ulua beach is a good snorkel spot for beginners and even children can handle this area. The waters are generally calm and it’s easy enough to swim your way around. This is another great place to see turtles on Maui. 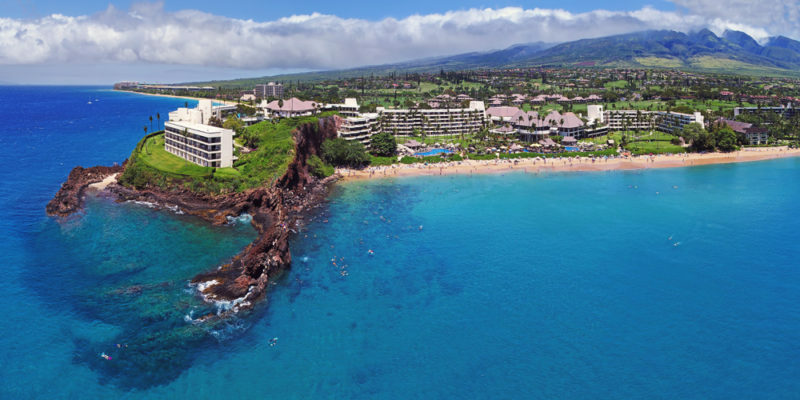 If you’re staying at the Kaanapali Resort, then you’re bound to hear about Puu Kekaa (Black Rock) and the cliff jumping ceremony. This same cliff is also a good place to snorkel, explore and be on the lookout for turtles. Another reason why this is such a good beach to go to is because Kaanapali is often rated as the best beach in Maui and even in the U.S.A. The beach is absolutely gorgeous, the waves are gentle, the snorkeling is fantastic, the cliff jumping is fun, and your feet just dive into all that sand like there’s no bottom. If you’re looking for privacy, Polo beach will give that to you. The waves are choppier here on windy days, so choose a calm day to come to Polo for an amazing view. The beach is hard to find so less people end up here, making it the perfect secluded beach. Sea turtles tend to hang out very close to shore so if you can handle the waves, it’s worth it to try your luck and see what’s floating along the rocks. Polo beach is actually 1 of 4 beaches that run along the Wailea beach path, and any of these beaches are a good choice for picnicking. Bring your meal and drinks and enjoy a lazy day of tanning, swimming and eating. 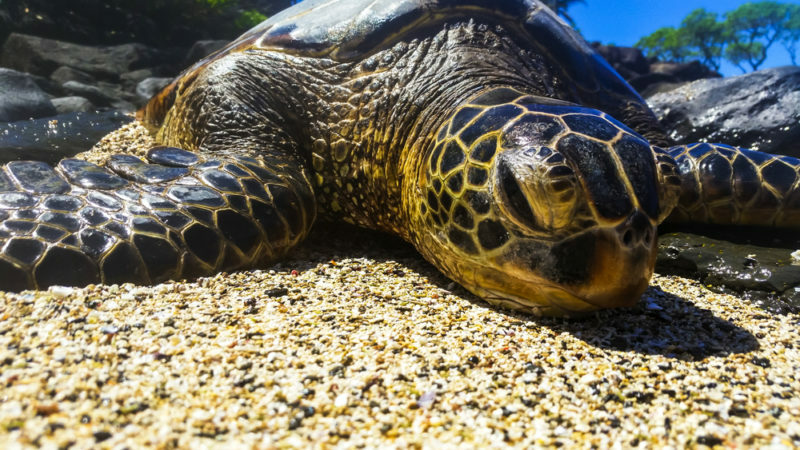 If you aren’t a snorkeler, don’t see any turtles on Maui, or just want a more educational experience on these green sea turtles, then head to the Maui Ocean Center. The Center is a highly educational experience with the purpose of informing the public about our precious ocean environment. 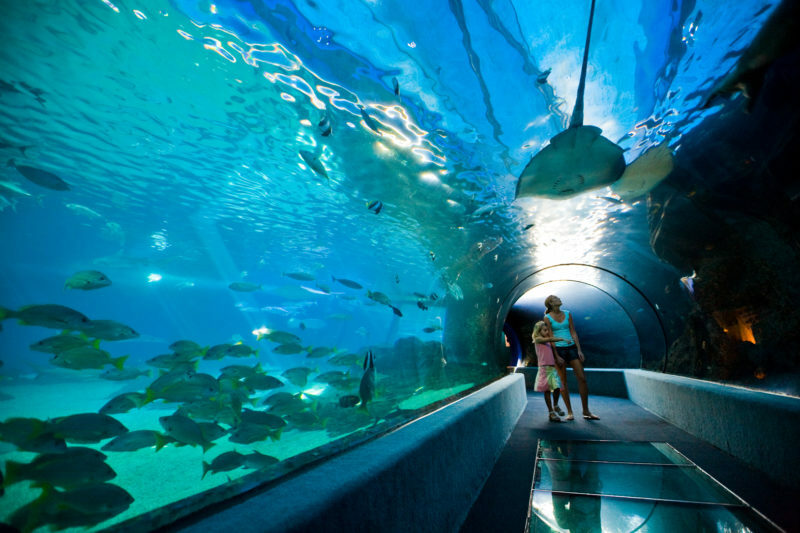 You’ll find this experience to be different than what’s offered at most aquariums. The staff are there to answer any and all questions and you can easily see the passion they all have for Hawaii’s native ocean life. The Turtle Lagoon is where you’ll be introduced to the Center’s sea turtles where they’ll feed and teach you all about these magnificent creatures that roam the islands at their pace. In addition, there’s also the shark tank, plenty of exhibits, the touch tank, a native plant tour, a huge souvenir shop and even a lovely restaurant with good food and an even better view of the harbor! Some of these extra activities will cost extra, but if it falls in your interests then it’s completely worth it. Napili bay is certainly beautiful and attracts a good amount of people because of how calm and easily accessible this beach is. The snorkeling is decent in the center where most people enter the ocean from but if you’re on the hunt for turtles on Maui, then swim to your left and hug the rocks to look for turtles. They like to hang a bit further out and the ocean life drastically differs from what’s living in the middle of Napili bay. Five Caves is a popular viewpoint for those who want to see turtles on Maui from a bird’s eye view. You’re bound to see these guys floating around as they graze or sleep to the lull of the waves and you may find it hard to see them at first since they look like rocks at first glance. But once you know what to look for, you’ll spot them easily and will surprise yourself on how many of them are actually right in front of you swimming about! Just a few miles off Maui’s shore, Molokini Crater is marketed as the best snorkeling spot in Maui, which you can only get to on a snorkeling tour. Unfortunately, turtles don’t hang out here so don’t expect to see them. 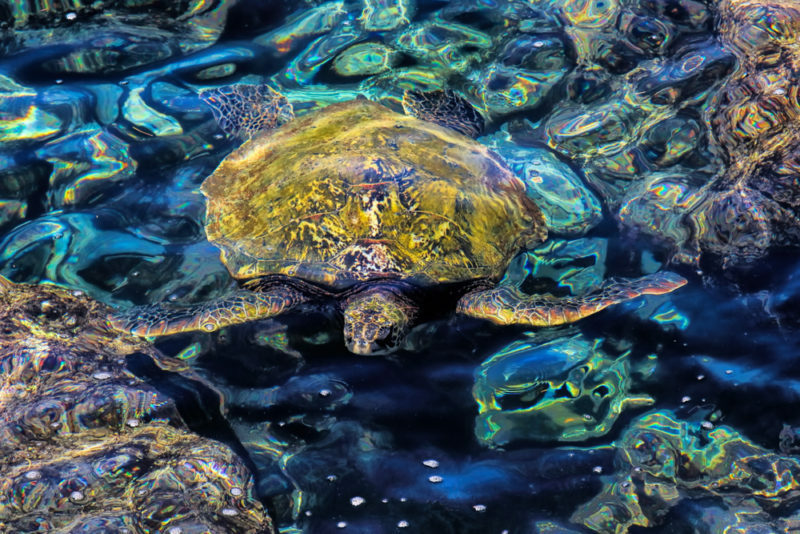 Luckily, most Molokini tours will add a stop to see turtles so make sure your tour includes a turtle snorkeling spot if you’re headed to Molokini. Turtles aren’t the only big sea creature you’ll see in Hawaii. Here’s what you need to know about Hawaiian monk seals. And if you love native Hawaiian animals, learn more about nene geese and pueo. If you want to see dolphins in addition to snorkeling, you can now add dolphin watching to Molokini and Turtle Town snorkel tours. 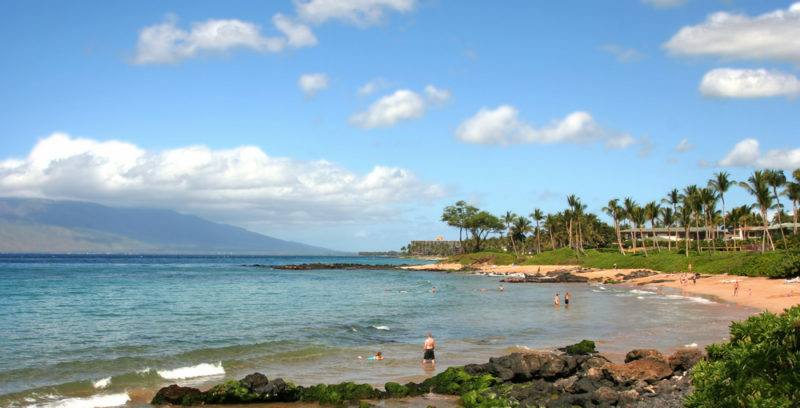 Several snorkeling tours in Maui will also take you to Lanai Island for snorkeling excursions. Lanai has very few visitors (and locals) so the snorkeling and diving here is excellent. Visiting Hawaii is a dream of mine, unfortunately from Europe it is so far away and requires so many layovers. This is the main reason I still haven’t been. Seeing the turtles would be a dream inside a dream. I missed my chance to see them while in Zanzibar. Since I am not a very good snorkeler I would probably prefer to see them when they come onto the beach. I wouldn’twant to miss my chance to photograph these lovely creatures. I have the exact same problem, except in the opposite direction! Lol. The turtles are awesome though. Once you do get here, I’m sure you won’t miss your chance to take a photo, they’re pretty slow! Hope you make it to the islands one day! Everything about turtles really makes me cry, they are such beautiful and majestic and amazing animals! I love them so much. I had the chance to live with them in Nicaragua and also to “free” a batch in Honduras and it’s one memory that will always live with me, but without a doubt I would like to expand my turtle experience and travel to Maui… It would be so amazing. They are so much fun to watch both in and out of the water. The best is when they look at you for a bit and just mosey on along! Your experience freeing that batch in Honduras must have been amazing!! I certainly hope you come over to your dream destination! Maui is one of my favorite islands since there are less people but you still have that busy town feel when you get to the larger neighborhoods. It’s got that country feeling to it! Turtle spotting just sounds perfect! Great that there are so many option on different places. I’ve never been snorkelling before so I’d certainly have to start at the beginner beaches but such a great experience. 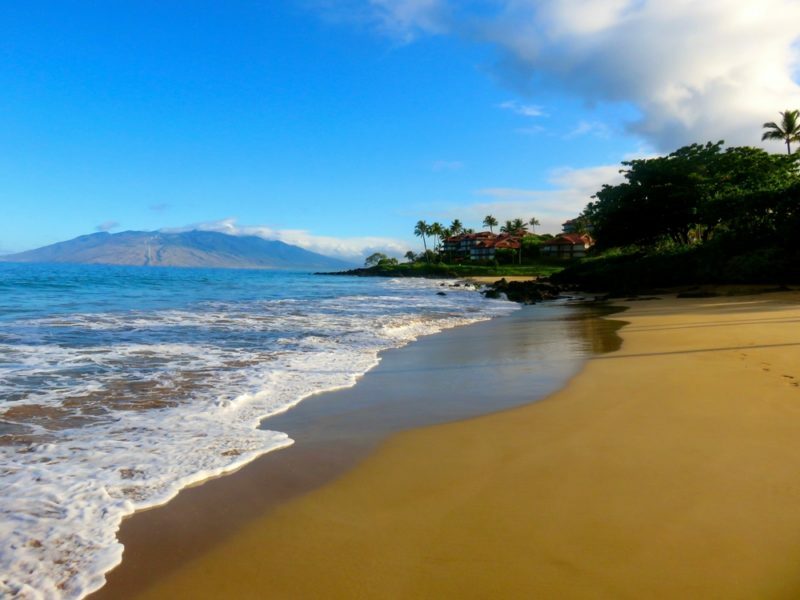 If you go to a resort like Kaanapali, the beach is yours to practice in. 🙂 The last time I went I took my friend who wasn’t a strong swimmer and we got an Airbnb close to Kaanapali. It’s required by law that Hawaii hotels need to keep beach access public so that could be an option for you. Hope that helps on your next Hawaiian snorkeling adventure! Great tips! Seeing turtles on Maui sounds like an amazing experience. I had no idea there are so many places to do so. The turtles look so cute in your pictures and I would love to see them in real life. They’re actually quite big when you first see them, lol. Especially in the water, they kinda loom and that initial surprise when they’re actually in front of you can shock you at first. I love to swim with sea turtles but only in an ethical way. Always try to stay behind them so you don’t startle them, never feed them, and don’t go near them when they’re on shore laying eggs. I agree. Here in Hawaii, not only are they protected federally and by the state, but we also have a cultural mindset about them. Bothering them is a taboo among locals since they are such a respected creature in Hawaiian traditions, legends and history. It is an absolutely wonderful experience. If you ever have the chance, whether it’s in Hawaii or someplace else in the world, I highly recommend it! Wonderful! I’m glad I could help! I certainly hope you make it over here, it’s beautiful!